This post covers four topics including: (1) reminding readers of a couple of upcoming colloquia and workshop events, (2) Happy Thanksgiving Holiday reunion for Astronomer Assistant Ruby, (3) How to write equations full of Greek characters backwards?, and (4) Observational plan for observing the binary eclipsing star Algol. So first, just to remind all of the physicist wannabes out there, the UCI Physics colloquia this week on Thursday looks especially interesting in that it is set to discuss "The Saga of the Sterile Neutrino Dark Matter". See you all there. Also, remember that the free two day workshop on "Searching for Life Across Space and Time" starts 12/5/16 at the Beckman Center. That should be interesting too, so see you there too! We hope you had a happy Thanksgiving holiday. We certainly had a good holiday, especially with a chance to get together again with Therapist, Author, and Book Store Owner, Heidi, and children for a fantastic dinner and celebration. For you longtime readers of this blog, you will remember that it was just one year ago, on Thanksgiving, that Astronomer Assistant, Ruby, joined our observatory staff, and meeting again with Heidi also meant that Ruby could meet up with her family. 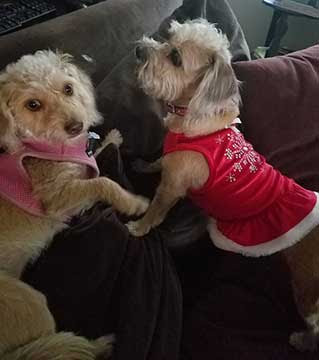 See the attached photo showing Astronomer Assistant, Ruby, and her mother, Pals, in her finest red dress, greeting each other. If you are curious about the events that led to Ruby's adoption, check out the November 29, 2015 post. Well, I finally got back to working on the General Relativity course, which I couldn't do on the cruise, due to low internet bandwidth. Now, I find that the course is very difficult and I am 3 weeks behind and there are no other students available to peer review my homework. Actually, even if there were peers available I have not been able to complete the homework. It's just too difficult and takes too much time for me. I think I understand the concepts involved, but when it comes to actually working out a homework type problem, I get lost very quickly. I'm not giving up though and will continue to listen to the lectures because I still learn some new material all the time. I know a couple of you readers are also continuing and I hope you are still making progress. I do want to comment on the technique used to film the lectures and the use of the transparent pane of glass as the blackboard. Last post I said that it appears that the professor seems to be writing the equations down backwards on the glass so that we on this side of the glass can read them correctly. 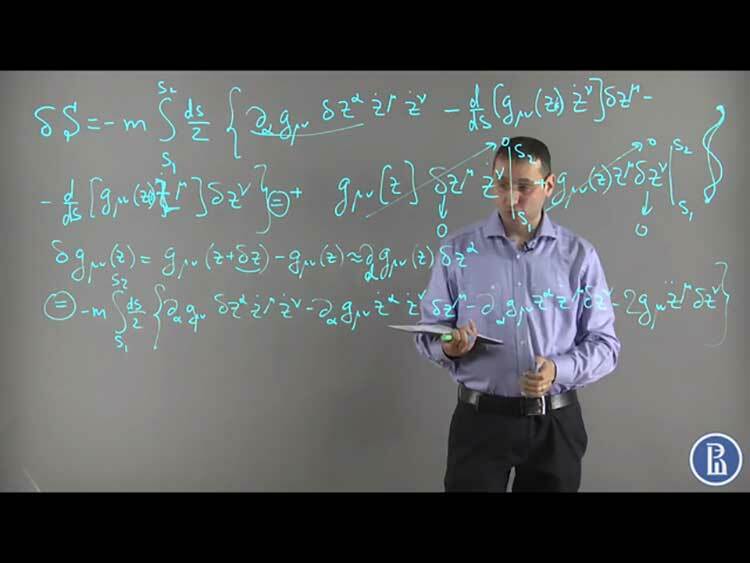 Wow, that would mean the instructor is very talented in terms of writing the equations and symbols backwards just so that we observers could read them. It turns out that the clever use of mirror imaging makes all of this easily accomplished. 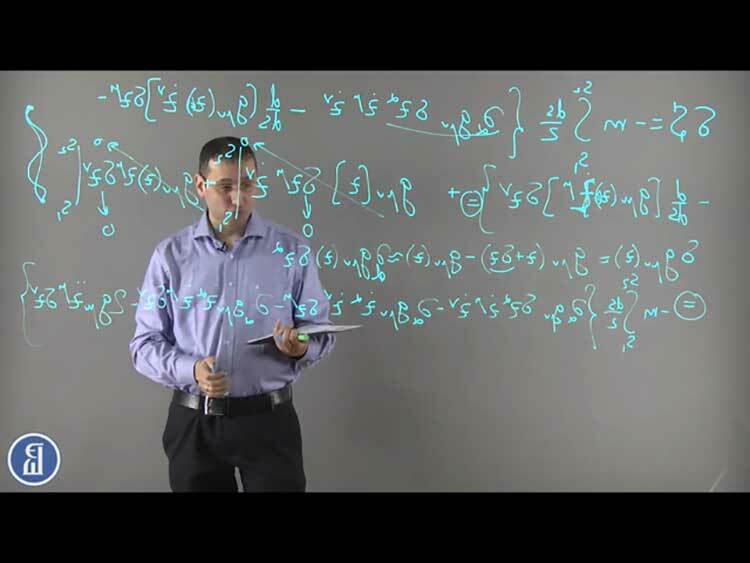 First of all, check out the following screenshot, which just shows one instant from the 15 minute video lecture. The equations are all written in good form and the symbols are all correct. I'm not saying that I can correctly tell that the equations are correct, only that they are written so that they seem to make sense. Now, take a look at this next photo which is the same screenshot, but it has been mirror imaged, using Photoshop, so that left and right are reversed. This image is the way the lecture would have been originally videotaped. When the lecture is then played back for our viewing the image is mirror flipped so that the equations and symbols come out in correct form for our viewing. Pretty neat! 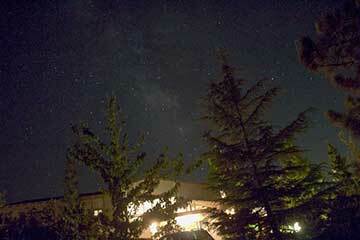 In fact, amateur astronomers are used to this effect already whenever we use a star diagonal mirror in our telescopes. It is just not apparent that an astronomical image has been mirror flipped because we are not used to seeing the objects directly without the use of a telescope, but the written symbols in the lecture can be easily recognized as being mirror flipped or not. Ok, ok, that is enough for the physicist wannabes out there and we should talk about the next astronomical observation plan now being considered. One goal that I have had for almost a year now is to capture some light curve data for a typical eclipsing binary system. I have mentioned this periodically in previous posts, the most recent on trying to measure eclipsing binary Sheliak as described in the July 15 and 24 posts. The binary star Algol, also known as Beta Persei, is visible at this time of they year in our night sky in the constellation Perseus, and goes through a 2.87 day period, which is much shorter than the 12.9 day period for Sheliak. Algol magnitude, normally at about 2.1, will dim to about 3.4 for 3-4 hours during the eclipse and then return to the normal magnitude. This happens even though it cannot be easily resolved as a binary system, but because the dimmer star eclipses the brighter partner and causes the observable light output to dim and this can be easily observed by amateurs. 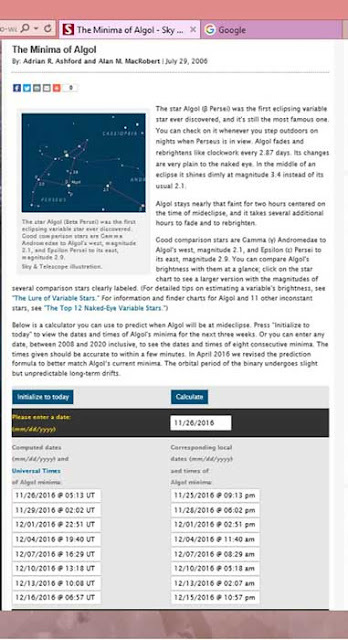 The screenshot below comes from Sky and Telescope's Minima of Algol calculator from which we see that the next best time to observe the eclipse minima is on December 15, 2016 at about 10:57 PST. Other earlier dates for the eclipse minima occur during the daylight hours and will not make for good observing opportunities. So, put December 15 on your observing calendar and plan for good weather. My tentative plan is to begin observations at about 8:30 PM and go to 1:00 AM and take images every 20 minutes or so. It's bound to be quite cold, but still exciting enough to make an attempt at capturing the images. Once the images are available, I will use some post processing with AIP4WIN software to examine the light collected from Algol and then plot the magnitude vs. time and hopefully see the eclipse occur in the data as the magnitude goes from nominal 2.1 to 3.4 magnitude. Some amateurs just use their eyeballs to track the eclipse and don't use a camera at all. If you are looking for a much more complete description of the eclipsing process and measurement techniques then check out OCA Secretary and Author, Bob's description in his book "Astronomical Discoveries You Can Make Too! - Replicating the work of the great observers". His Project 28 in that book lists a very good description of the technique and light curve modelling of such observations. So, read up and get it on your calendar!